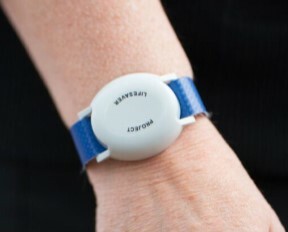 LOS ANGELES – A new system of trackable bracelets designed to quickly locate people with autism, dementia or Alzheimer’s disease when they go missing was introduced Wednesday by Los Angeles County officials. “L.A. Found” features a system of electronic bracelets that can be located using receivers carried in Los Angeles County Sheriff’s Department helicopters and designated ground units. Wandering is a common problem associated with dementia, Alzheimer’s and autism. According to the Alzheimer’s Association, 60 percent of people with dementia will wander at some point, while a study by the Interactive Autism Network found that 49 percent of children with autism will engage in wandering behavior. While the vast majority of those individuals are recovered, wandering cases can end in tragedy. The program is the result of community input and expert recommendations through the Bringing Our Loved Ones Home Task Force, originally proposed through a motion authored by Supervisor Janice Hahn and co-authored by Supervisor Kathryn Barger. In February 2018, the Board of Supervisors unanimously approved a comprehensive set of strategies proposed by the BOLOH Task Force, including a countywide pilot program to provide trackable bracelets to county residents. L.A. County has more than 177,000 residents with Alzheimer’s disease, along with a large population of people with autism and other developmental disorders that make them susceptible to wandering. To learn how to qualify for a bracelet, caregivers can visit www.LAFound.com.